This official Bunco Cell Phone charm will become the mascot to your conversations. Adorable Bunco Charm with hanging die accent. Be creative! Charms attach to your phone on a thin black or color cord. The cord is approx. 2" long. Simply loop the cord through the strap bar, or attach to your antenna. 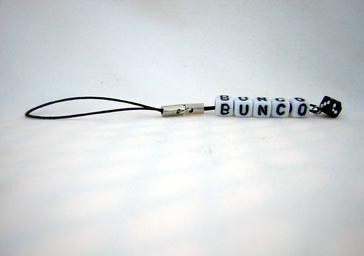 Bunco enthusiasts are being creative and using these Bunco charms on wallets, purses, laptops, luggage, dog leashes, fanny packs, and all types of portable electronic devices. Handcrafted for the Bunco enthusiasts for that special Bunco gift or simply treat yourself to this Bunco multi purpose charm.